Pois é, durou pouco a volta da GS500. Por não atender ao PROMOT3, as concessionárias já estão noticiando que não haverá o modelo 09/09, ficando o modelo 08/09 como o último a ser comercializado. Fonte: A concessionária Suzuki mais próxima de sua casa. APPEARANCE: Look at the photo above and decide for yourself. I've found that most folks think that the V-Stroms are quite ugly, but to me their homeliness is really quite endearing. The two models might appear almost identical, but I prefer the looks of the dual exhaust on the DL1000 and also the appearance of the belly pan below the engine on the big brother. Not a big advantage, but I really like the appearance of the DL1000 a little better. ACCELERATION: Just what you'd expect; the performance numbers favor the more powerful DL1000. The few road tests I've seen on the two have the litre-bike about 1/2-sec quicker in the 0-60 sprint, 6 or 7-tenths quicker in the 1/4 mile and a top speed of about 125 MPH vs 115 MPH for the DL650. If you are making your decision strictly on straight-line acceleration the obvious choice is the DL1000, but then again if that is of supreme importance you might want to consider a sportbike instead. My own opinion is that the real-world difference is not as great as the numbers might indicate; I have never felt underpowered aboard the 650, and in most riding situations it just doesn't feel significantly slower than its big brother. STREET HANDLING: Though Suzuki lists the DL650 as about 40 pounds lighter dry weight, it feels even smaller; perhaps it's the slightly lower seat height, but the wee-Strom seems to have a decidedly lower center of gravity. These factors translate into a ride that makes the 650 much more nimble and "flickable". Low-speed and parking-lot maneuvers are simply easier on the smaller bike. This is not to say that the DL1000 is a slug; it's not a superbike, but it can be a very capable canyon carver in the hands of a capable rider. Both bikes are a pleasure to ride on the street, but the handling nod must go to the DL650. OFF-ROAD HANDLING: Neither bike is an enduro machine, but either can survive pretty well off-road. I do quite of bit of riding on gravel ranch roads, and I have found that this is the area where the differences in the two bikes are the greatest. Simply put, the lower weight and lower center of gravity of the DL650 give it a real advantage over the DL1000 when the pavement ends. Either ride will be too heavy for the average rider to toss around, but it's definitely less work to keep the 650 in the vertical position. HIGHWAY RIDING: Most of my riding is done solo, at highway speeds on lightly-traveled state highways. I was surprised to discover that there was very little difference between the two bikes under these circumstances; I had assumed that the larger motorcycle would be much more stable on the road, but that simply wasn't the case. Both cruised smoothly and effortlessly, and both offered plenty of passing power when needed. I don't normally ride two-up, but I asked a buddy along on a ride to see how both machines fared under load. The results were predictable; the DL650 performed pretty well with a passenger and luggage, but the added grunt of the big Strom might be welcome in the hills or in passing situations. MISCELLANEOUS: Both bikes run well on 87-octane fuel, but the DL650 delivers 8-10% better economy than does its big brother. The DL1000 has a hydraulic clutch mechanism, but the cable-operated setup on the 650 is so smooth that there is no noticeable advantage to either. Speaking of smooth, it's a nice one-word description of the DL650's engine; it's a real jewel. It is much more quiet and refined than the DL1000 powerplant, which emits a large range of mechanical noises. The overall ride experience of the 650 is much smoother, with the DL1000 responding with more brute force. Perhaps the biggest surprise for me is the difference in the way the two engines deliver their power. You might think that the smaller engine would be "peaky" with low torque, but it seems to me to be quite the opposite; I found myself downshifting the DL1000 more often that I did the DL650. The Wee-Strom just seems to be more linear in its power delivery. As might be expected, the DL650 lacks some amenities that are standard on the larger bike--hand guards are just one example. In my opinion, neither bike offers adequate protection for the front-mounted oil filter, but the DL1000's plastic belly pan at least offers some protection from flying rocks. The aftermarket has recognized the popularity of both the V-Stroms, however, and you'll find a pretty good selection of add-ons, accessories and farkles to make your ride uniquely your own. SO WHICH IS BETTER? Depends on your reasons for buying the bike. If you're a sensible Consumer Reports-type of buyer you'll be wise to choose the DL650; you'll get about 90% of the performance of the larger bike for about 74% of the purchase price. You'll save on gas, and the 650 is generally much less expensive to insure. It's for good reason that many motorcycle publications include this machine on their "best buy" lists, and Cycle World magazine (09/06) says that the DL650 "may just be the most shockingly competent machine in the world today." On the other hand, if 2-up touring is your style or if you just can't live with a bike that won't run sub-12-second quarter miles then head for the DL1000. It's a little embarrassing for an AARP-eligible minister to say, but there's something about lifting the front wheel off the pavement that still brings a silly grin to my ugly mug. Either machine will leave its owner with a smile, but if you force me to make a choice I'll pick the Wee-Strom every time. At this time there's only one bike in my garage--a DL650--and I couldn't be more satisfied with the choice. Tradicional evento motociclístico do Sertão do Pajeú, Estado do Pernambuco, realizado nos dias 23, 24 e 25 de janeiro de 2009. O Trilhados MC esteve representado na pessoa de seu presidente, Ciro Sabino, em companhia do aspira Luiz Lima. Hoje foi um dia úmido em nossas vidas!!! Saimos de Vitoria com tempo feio, mas o dilúvio mesmo aconteceu na região de Macaé e Tanguá... Muita agua!!! Agora estamos no RJ na casa de meu sogro pai! Por hoje é só pq a tensâo foi grande, esperamos encontrar o caminho pra Sampa mais seco! Obrigada pela hospedagem e por todo carinho!!! Foi uma viagem especial onde o lado Humano falou mais alto dq a paisagem!!! E a camisa do Trilhados chegou em São Paulo!!!! Agradeço a todos que nos acompanharam pelo fotolog, pela torcida positiva! Por todos que nos receberam com carinho... Em nossos sonhos maiores e mais otimistas não cheguamos nem perto de imaginar o quanto seria maravilhoso estar com vcs! Mas o Dia é dele! Para meu companheiro de viagem! Para o papai de Amanda e Tommy! Eu e seus filhos desejamos que nossa familia continue assim... Sempre unidos... Não precisa mudar nadinha! Saúde e proteção divina é muito importante! Disposição pra continuar nossas aventuras! Amanhã volto a visitar todo mundo normalmente pq hoje estaremos preparando o bolo e as velinhas!!! Encerramos por aqui as publicações dos boletins informativos sobre a viagem do casal Ele & Ela. Após mais de 20 dias de passeios, algumas novas amizades e muita estrada, Armando e Claudia, formadores da dupla de motociclistas Ele & Ela, já está em casa. Claudia telefonou de sua residência hoje, sexta-feira, dia 23 de janeiro de 2009, por volta das 16 horas, comunicando que haviam chegado em paz. Agradecemos a Deus por esta aventura ter acabado bem. Agradecemos ao Pai Celestial por ter levado os nossos grandes amigos sãos e salvos de volta ao lar. São os instantes finais da viagem. Amanhã, com a proteção de Deus, eles chega´~am em casa. Fotos e relatos tirados do fotolog de Claudia. Tä bom! Eu admito que sou pessima conhecedora de plantações, mas me pareceu ser mandioca! Esta eu sei oq é!!!! E o barulho chamava atenção delas, que ficavam olhando curiosas!!!! Nesta viagem aqui na BA encontrei Carminha, Claudio, Thales... Joel e familia e a Linda Say!!!! Esta passagem vai deixar saudades!!!! A hora que isso não acontecer vamos estranhar!!! São nossos anjos, pessoas e aparecem cheias de boas intenções... Parece mentira acontecer isso nos dias de hoje, né???? Prazer Marcos! E muito obrigada!!!! Desejamos que vc só tenha Ótimas estradas em seu caminho com sua nova máquina!!! Mas meu pé é redondo people!!!!! Amores de casa! Faltam 2 dias!!!! Boa Viagem, Ciro e Luiz! O nosso Presidente e o Aspira Luiz Lima estarão, na próxima sexta-feira, pegando a estrada rumo a cidade de Afogados da Ingazeira, no estado do Pernambuco. Eles irão nos representar no evento VIII Encontro de Motociclistas do Sertão do Alto Pajeú, festa essa regionalmente conhecida. Quem tiver interesse de participar dessa viagem junto aos dois deve entrar em contato o quanto antes com Ciro para pegar maiores informações. Essa será a primeira viagem de Luiz como Aspirante a ingresso. Com Afogados, ele já vai começar com bola cheia! Ambos motociclistas ficarão confortavelmente hospedados em barracas de camping! Desejamos boa viagem aos dois. Que Deus leve e traga-os em paz. DISPOMOS DE ÁREA DE CAMPING COM TOTAL SEGURANÇA, ESTACIONAMENTO, BANHEIROS MASCULINOS E FEMININOS E TODA INFRAESTRUTURA NECESSÁRIA – TRAGAM BARRACAS E/OU COLCHONETES. QUADRA POLI ESPORTIVA COM TOTAL INFRA-ESTRUTURA: BANHEIROS MASCULINOS E FEMININOS, SEGURANÇA, ESTACIONAMENTO, ÓTIMA VENTILAÇÃO. Promoção Brasão de Moto Clube mais Bonito do Brasil! Agora imagine o seu Moto Clube recebendo uma placa do Brasão de Moto Clube mais bonito do Brasil das mãos do astro Peter Fonda no grande palco central do evento. Pois esta é mais uma promoção Moto Road para vocês! Basta enviar os dados e uma imagem do brasão do seu Moto Clube para o formulário abaixo e torcer para seu brasão ser o mais votado. Faça a inscrição agora clicando aqui! Coisas que acontecem com Ele e Ela! No meio daquele mundão de gente, fomos convidados para conhecer a cabine de comando!!!! E o nome da embarcação? Baiana! Maria Bethania!!!! E aí estão as meninas, do lado direito pousadas na Maria Bethania aproveitando os poucos momentos do dia onde as rodinhas não estavam no asfalto!!!! Armando esta empenhado em colher material pra edição do filme caseiro que alimenta nossa saudade da estrada durante o ano!!!! No bar do Ferry Boat, mas oq eu queria mesmo, apesar do calor era um Cafezinho pra me manter bem acordada!!!! A melhor parada de hoje!!!! Ah sim!!! Uma tapioca deliciosa!!! Olhando esta foto fico imaginando minhas amigas peruas sentadas aí!!!! hahaha Impossivel imaginar a Simone neste "Restaurante"... A diferença é que eu AMO tudo isso!!!! Aquele mesmo caminhoneiro nos ajudou a modificar o final de nosso trajeto... Cancelamos Minas Gerais, pois segundo ele as estradas por lá não estão em boas condições por causa das ultimas chuvas... Não dá pra arriscar... Voltaremos pelo RJ... Desta forma vou poder ver meu irmão, e isso é bom!!!! Tommy, meu anjo, faça um esforço pra tomar bastante liquidos, pra ficar bom! Assim poderemos comemorar o niiver do papai no sabado, tá bom???!!!! Mãe! Oferece bastante liquido pro Tommy, mas.... Amanda! Não deixe a mamãe afogar meu filhote!!! Comemoração do aniversário de Ciro, realizada no dia 15 de janeiro de 2009, nas dependências do bar Cana Café, com a presença ilustre do casal Ele & Ela, numa noite de muita alegria e emoção. Fotos gentilmente cedidas pelos amigos Éder, Brilhante e Ferrugem. Depois de dormir bem gostoso, acordei assim prontinha pra desbravar Salvador pelas mãos de minha amiga Sayonara! A "onssa pintada"! E o dia foi mesmo Perfeito!!!! Eu me transformei temporariamente numa baiana! Esta boneca nos pegou no hotel e ficou todo o dia conosco! Simpatica, risonha e divertida nos proporcionou um dia espetacular! Amiga, quando eu encontrar o Eduard certamente darei seu tel pra ele e só assim, mas só assim mesmo... poderei retribuir tanta gentileza!!!! Nesta foto estavamos num DELICIOSO almoço típico! Uma preciosa dica de nossa anfitriã!!!! Igreja do Senhor do Bonfin! Esta foi a imagem do dia... A grade que cerca a igreja tomada em toda sua extenção por fitinhas do Bonfin... As pessoas amarram e fazem 3 pedidos... O efeito é lindo e o colorido???!!! !Com o ventinho as fitas ficam bailando como se estivessem felizes!!!! É claro que também fiz meus 3 pedidos, mas não posso contar! Minha fitinha, é claro, era vermelha!!! Mas um vez Obrigada Say! Salvador não seria tão especial sem sua simpatia! Postei 6 fotos incluindo a fotinha com Say! Amores de casa estamos voltando!!! Alan César – Aspirante a Trilhado! O motociclista Alan César dos Santos Dantas, 21 anos de idade, devidamente habilitado para pilotar motocicletas, atualmente trabalhando como operador de caixa do Posto América, proprietário de uma Yamaha Fazer 250cc de cor preta, evangélico, deseja tentar o seu ingresso no Trilhados Moto Clube. O mesmo já foi devidamente avisado a cerca de todo o processo de ingresso no grupo, ou seja, a respeito das quatro Reuniões Sociais e das quatro Viagens Oficiais nas que deve se fazer presente antes de ter a sua aceitação votada pelos Membros Efetivos do Grupo. O apadrinhamento de Alan foi feito por Éder Negreiros, Vice Presidente do Trilhados M. C., e será devidamente oficializado na primeira Reunião Social em que se fizer presente. Desde já desejamos boa sorte a Alan e iniciamos o trabalho de analise de sua pessoa. Torcemos para que ele seja apto a fazer parte do nosso Moto Clube e para, junto a nós, cortar as estradas de nossa bela região! Hoje o Tommy deu um susto na vovó!!! Ainda bem que foi agora e não no dia de ir pra Fortaleza!!! Saímos hoje cedo cheios de disposição... Nós já conheciamos a cidade, desta forma foi mais facil abandonar o turismo por 24 horas!!!! Tomamos um banho e fomos passear na orla e encontramos a simpática feirinha, e obviamente fui conferir!!!! Vovó cobrindo o moleque de mimos e muita manha!!!! Amigos de Mossoró... Já estamos morrendo de saudades!!!! Até amanhã people! Em Salvador! Se Deus permitir!!!! Saimos cedo de Maceió... Tinhamos 600km para percorrer! Fomos até esta cidade nas margens do Velho Chico onde iriamos atravessar o Rio de balsa, mas por motivos tecnicos não conseguimos concluir a travessia, mesmo pq na minha opinião não é indicada para motcicletas de grande porte... Pegamos a estrada novamente onde encontramos uma vaca rebelde que me deu um susto danado!!! Já instalada recebi um telefonema da amiga aqui do fotolog "onssa pintada" e combinamos de nos encontrar amanhã... Ela vai nos levar para um passeio por pontos turisticos! Nada como conhecer a cidade com uma guia especial!!!! Sim! Pq amanhã é dia de parar as maquinas e fazer o papel de turista!!!! O Tommy já está bem melhor graças a Deus e a vovó que cuidou tão bem do meu fofo... E agora a irmã já está em casa pajeando ele também!!!! Beijocas pra minha turminha em casa! Amigos do fotolog... otima semana pra vcs!!!!! Faremos uma Reunião Social no sábado, dia 24 de janeiro de 2009, a partir das 20 horas. O local para esta ainda será acertado. Sobre essa decisão, estamos abertos a sugestões dos interessados. Contamos com a colaboração de todos! Vale restaurante, lanchonete, praça, sorveteria, bar, etc. O local deve ser decidido com base nas sugestões aqui publicadas e anunciado muito em breve. 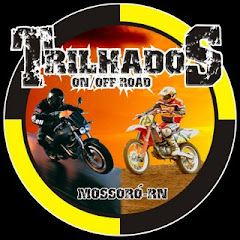 Desde já, que todos se sintam convidados (motociclistas e admiradores desse estilo de vida de Mossoró e região). Não tem outra palavra pra combinar com Tommy!!!! Deus nos abasteceu de amor e alegria!!!! E certamente outros momentos tão bons quanto estes virão por aí!!!! Hoje é dia do Tommy voar pra Sampa! Foi muito bom... Foi como coroar a chegada em Fortaleza!!! Essa parte vai ser DURA!!!!! Provavelmente irei embora sem encontrar as pessoas que gostaria aqui em Fortaleza... Mas estou indo com a promessa de voltar em junho... Sem as motos oq deixa mais tempo livre, pois a viagem demora muitooooooooooooooooo, mas muitoooooooooooooo menos!!!! Mandinha e Mamãe segurem o moleque! Ele entrou como um rapaz e nós ficamos com o coração partido!!!! Na entrada da cidade. nossos amigos nos esperavam com uma otima noticia! O Paulo passou para a Universidade Federal! E olha eu (morrendo de pena!) cortando o cabelinho dele!!! !